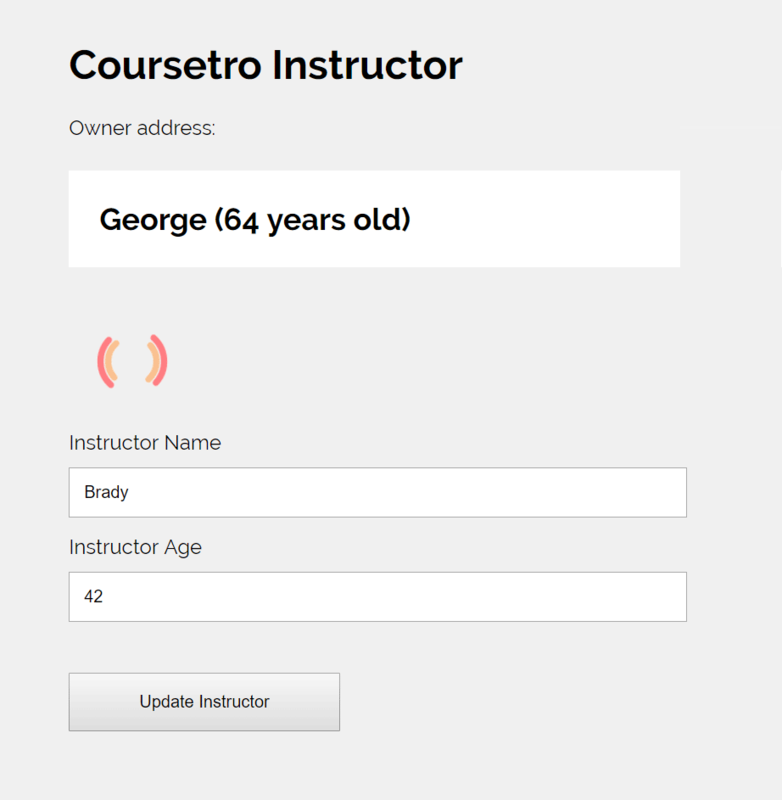 In the previous lesson, our smart contract allowed you to set an Instructor name and age. You clicked a button to submit the new data to the contract, yet nothing happened in our GUI to give us an indication about the status of the transaction. That's what events are for, and that's what we're going to cover in this lesson. In our example, this would mean providing a loading indicator that would disappear only once the transaction had been confirmed, and then update the name and age of the instructor. It sets and gets an instructor's age and name. Notice we're passing in 2 types that will represent the name and age. When the event is successfully returned in the UI, we can access these values. Being that this tutorial is based on an on-going project from our Ethereum Developer's Course, you will need access to the previous lesson's project state to continue on. You can join the course for free and access the project files that way, or I will try to remember to create a Github repo where you can access them there. We're going to make some changes to this. First, we no longer need to call Coursetro.getInstructor(), so we're going to remove that. Before any of this will work, make sure you remember to use the Remix IDE to deploy the updated contract, copy and paste the ABI along with the new smart contract address. You will also need to make sure testrpc is running in the console. If you did everything correctly, you can now view index.html in the browser, specify a name and age and hit Set Instructor. You should now have a solid understanding of how to create and use Solidity / Smart Contract Events with your decentralized apps. In the next lesson, we're going to continue on by learning more about Developing Ethereum Smart Contracts for Beginners.